Are you that kind of person who wants to serve gourmet stylish dishes to guests yet doesn’t want to slog in the kitchen for endless hours? If yes, then give me a high five. I love those dishes which are quick to prepare but have a high style quotient ;) One look at the dish and your guest should feel like a royal dignitary. I love having friends at my place but don’t want to ruin my own fun by spending all the time in front of the stove. Therefore, I prefer having MAKE AHEAD DISHES which you can prepare beforehand and then present in a stylish way when your guests are there. Salsa is one dish which I love to make. With slight variations you can make an infinite number of combinations. Add a bit of this and that and some basic spices with lemon juice and Tadaaa! Done! Serve it with a platter of Chips, Nachos, Crisps or Crackers. And one more thing which is actually my secret, bring your ear closer- It tastes great even with Indian papdis and namakpare/namkeen! Did I tell you it’s diet friendly too?! So all your gym freak friends can forget about their diet and can happily and whole-heartedly gorge on to this. 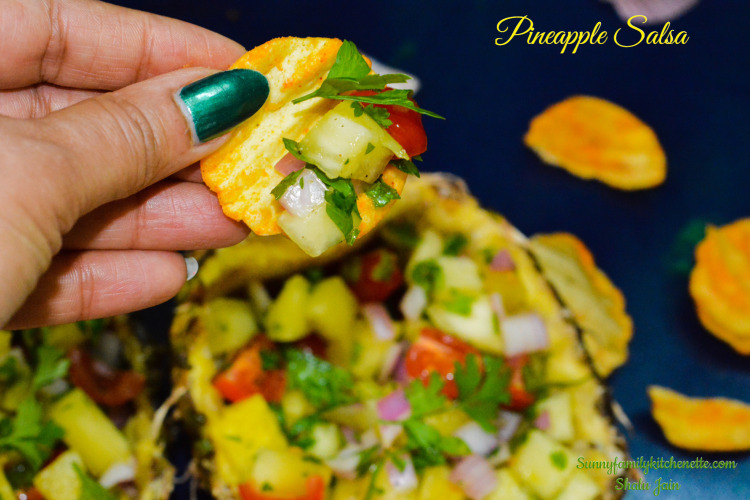 This Pineapple Salsa tastes sooo fresh, sooo delicious. Loaded with fresh pineapple, tomatoes and onions- it’s like Ohhh Spring and Summer in your mouth. -Gives your serving style that Ooomph factor!!! Let’s quickly jump to the recipe to make this super quick snack. 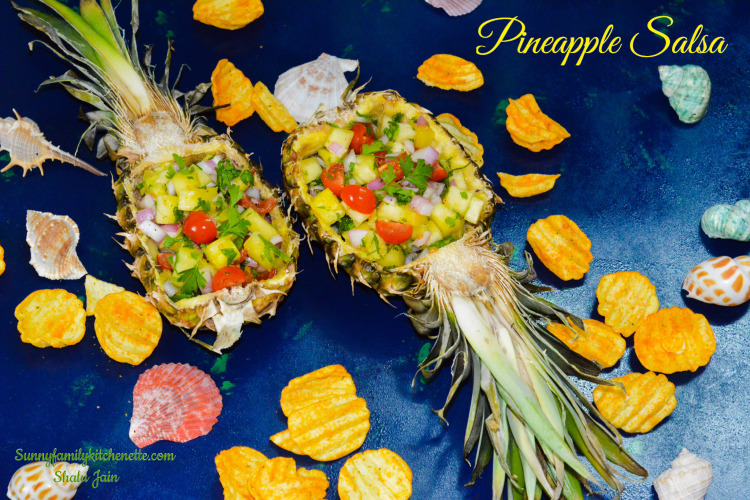 Chop Pineapple chunks into small pieces. 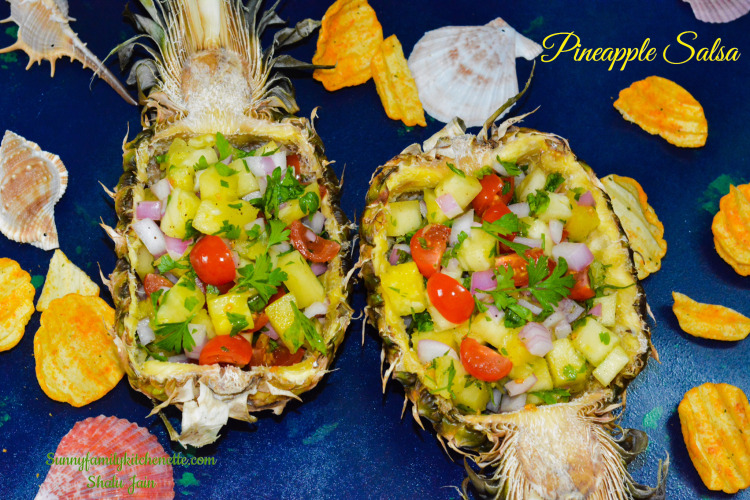 Mix chopped Pineapple, Onion, Cherry Tomatoes and coriander leaves. In another bowl make the dressing by mixing lemon juice,salt,chaat masala and black pepper. Let sit for 15-20 mins before eating for best flavor. Serve with your choice of chips and crisps. The salsa looks fantastic and full of flavours ! !